101 Dalmatians is Disney’s animated classic about Dalmatians, Pongo and Perdita, who are frantically on the lookout for their 15 puppies dog napped by Cruella De Ville. Villainess Cruella DeVille has plans to make the pups, along with many others, into a fur coat. A rescue mission with the “twilight bark” and Pongo and Perdita are finally reunited with more than they hoped for – 101 Dalmatian puppies! 101 Dalmatians costumes ideas are as plentiful as the pups themselves. Dress up as a spotted Dalmatian, such as Lucky or Patches, in a cute white and black jumpsuit for children or cozy, hooded Dalmatian cape for infants. 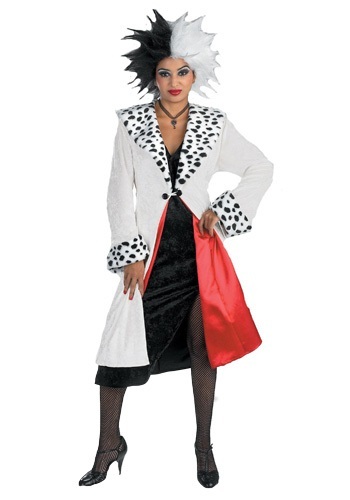 Women and girls will have fun playing the bad girl in a Cruella de Villecostume with black and white dress and salt and pepper wig. Add a long toy cigarette holder and faux fur spotted stole for a true-to-the movie look. If heading out with a group, have other members of the pack dress up as a dog.